Ellen Butler’s “The Brass Compass,” tells the compelling story of a heroine standing strong against all odds. 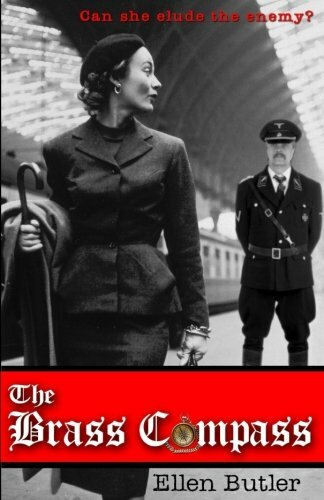 This historical fiction paints the riveting tale of brave Lily Saint James, whose unfortunate circumstances trap her in WWII Germany without any contacts. Butler’s portrayal of Lily was nuanced and alive. As a female reader, it was particularly thrilling to read a story about a strong woman when so much historical fiction is focused on male protagonists. Getting to see a male-saturated historical event like WWII through the eyes of an intelligent and vivacious female protagonist was refreshing. Refreshing is the word that best describes Butler’s narrative. From start to finish, Lily’s story kept me on the edge and wanting more. I powered through the entire book in two shorts days, still wanting more. Butler demonstrated her skill in both dialogue and narrative, with description and emotion being perfectly portrayed on each page. Additionally, she proves herself more than capable of handling the knowledge of an accurately portrayed historical fiction. Butler did her research, capitalizing on it not only for the bigger events, but also for the small details. Overall, the description, dialogue, and historical knowledge made for a compelling narrative. Of course, this story did seem to fall into typical pattern of historical fiction in that the beginning was slow. While I almost immediately felt connected to Lily, the details, dialogue, and fuller story did not fully coalesce until about half way through the novel. Although Butler’s historical knowledge was great, there were several times throughout the early half that felt like information dumps that hindered the narrative rather than pushing it forward. While I understand these moments are needed to ground the reader in the moment, I would have much preferred a smoother transition into a narrative instead of what felt like the occasional pause to understand the historical significance. Still, this novel was endearing. Lily herself was great. I was worried in several parts that Lily was a practitioner of some type of Nancy Drew type perfection. Strong female characters are wonderful, but I also prefer characters who can read-as and feel real. At first, Lily seemed to have a quick and witty solution to every problem to she encountered with little to no hassle. As the narrative continued, however, Lily had moments of self-doubt, fumbling, and hesitance. Butler’s writing was strong here, demonstrating that she more than has the ability to produce a character that is both determined yet believable. Overall, “The Brass Compass,” by Ellen Butler felt like equal parts adventure, romance, coming-of-age, and history. Butler’s writing style was captivating and her characters even more so. Despite the slow pace at the start, the story eventually becomes a riveting page turner. This novel would be good for anyone who is looking to read the adventures of a strong female character. It is especially great for anyone who is looking for the unconventional WWII narrative. Butler delivers Lily’s story with both style and grace, and I can’t wait to read more from her.